The Becke3LYP/6-31G* optimized structure of the cis,syn cyclobutane uracil dimer 1 is shown in Figure 3. The overall structure is in very good agreement with the reported X-ray structures of various derivatives of 1  and with the UHF/6-31G* optimized structure of the cis,syn cyclobutane thymine dimer. 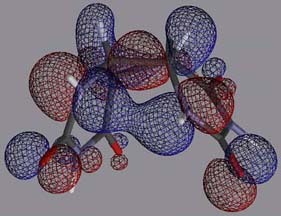 An important feature of this structure is the puckering of the central cyclobutane ring by 20o, which leads to a distortion of the C2-symmetry of the molecule. This is in marked contrast to the planar cyclobutane ring obtained by semiempirical calculations. 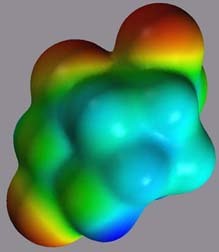 Although the force constants for the dihedral angles in the cyclobutane ring are relatively small, it is clear from the helical structure of DNA and the available X-ray crystallographic data that the puckered cyclobutane ring is present in all known derivatives of 1. 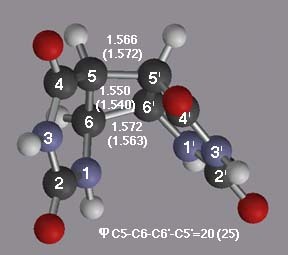 The dihedral angle in this part of the molecule determines in turn the position of the more polar carbonyl groups. The remaining bond lengths and angles are in the typical range of their respective chemical environment. The effect of the ring puckering on the position of the carbonyl functions is clearly recognizable in the two orientations of the electrostatic potentials, projected on an isodensity surface. Shown on the left in Figure 4 is a view of the molecule in the same orientation as in Figure 3. The polar groups in this part of the molecule form a distinct partial charge pattern. Only three of the carbonyl groups are in a plane, whereas the fourth one at the C4' position is positioned 1.677 Å above the plane. As shown in Figure 4 right, the cyclobutyl moiety of 1 is considerably less polar. In the model system chosen here, the N1 and N1' positions are substantially more electrophilic than the N3 and N3' nitrogens. This effect will not be present in the actual dimer, where the N1 and N1' positions are linked to the ribophosphate backbone. The analysis of the HOMO and LUMO orbitals of 1, shown in Figure 5, allows an estimate of the effect of the electron transfer. In case of an oxidative electron transfer to form the radical cation 1*+, the C6-C6' bond will be weakened by the removal of an electron. 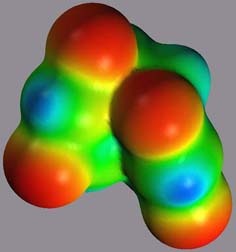 In contrast, the LUMO is largely localized in the pyrimidine ring and features a nodal plane perpendicular to the cyclobutyl ring. A reductive electron transfer to form 1*- will therefore have a smaller effect on the structure of the initial product of the electron transfer, 1*-. The polarity pattern of 1 is in excellent agreement with the mode of binding suggested by Park et. al. 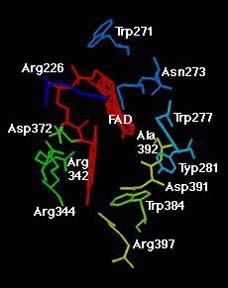 Based on the three dimensional structure of the active site of DNA photolyase, shown in Figure 6, and the results described above, the following binding mode can be anticipated: The more polar moiety of 1 could form binding interactions with the polar region of the active site (formed by the FAD, Asn273, Arg342, Arg344 and Asn273). In this orientation, one of the planar pyrimidine rings could interact via a pi-pi interaction with the isoalloxazine ring system of FAD. 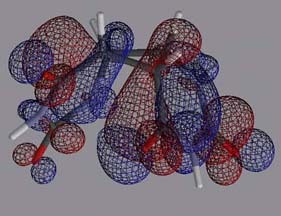 The nonpolar cyclobutane part could then interact with the hydrophobic amino acid residues Trp277, Trp384 and Tyr281. In this orientation, 1 would have a diameter of aproximately 6.5 Å in the plane parallel to the protein surface, suitable for a fit into the putative active site as shown in Figure 6, right. Further docking studies to investigate the geometry of the enzyme-substrate complex and to estimate the energy of binding are in progress and will be reported in due course.